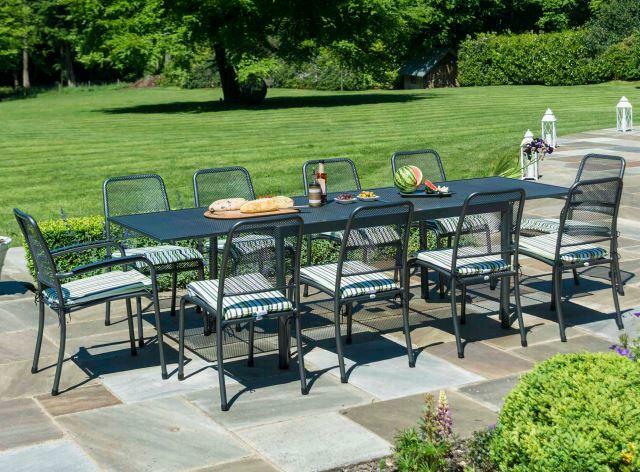 A modern, casual garden dining set that offers great value for money for a large and extending table and 10 chairs that will allow you to invite more people round for a BBQ! 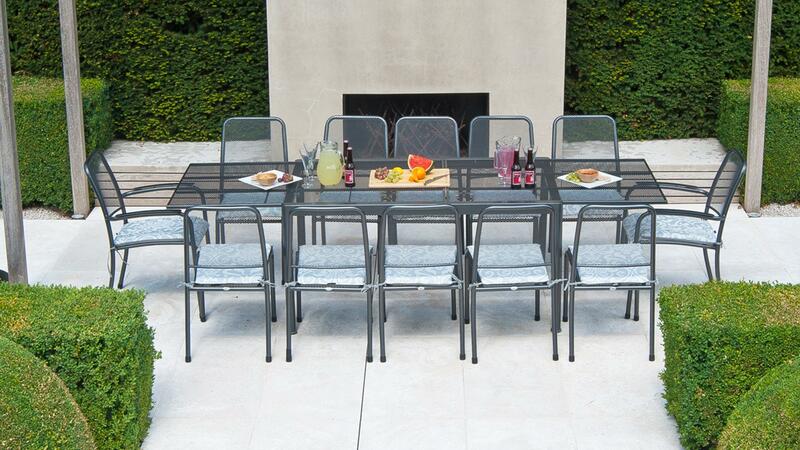 The set is constructed in fine, powder coated mild steel and wire mesh in a dark graphite grey colourway. Treated with a phosphate solution and primed with a cathodic dip to prevent corrosion. 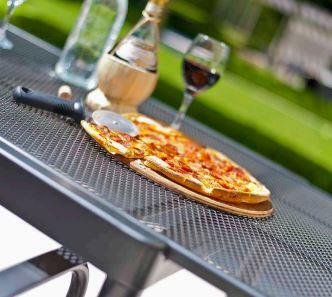 The table extends from 1.5 meters to 2.7 metres offering a great deal of flexibility for your outdoor dining. PLEASE NOTE, the set priced here has 2 x stacking Armchairs and 8 stacking Side chairs. 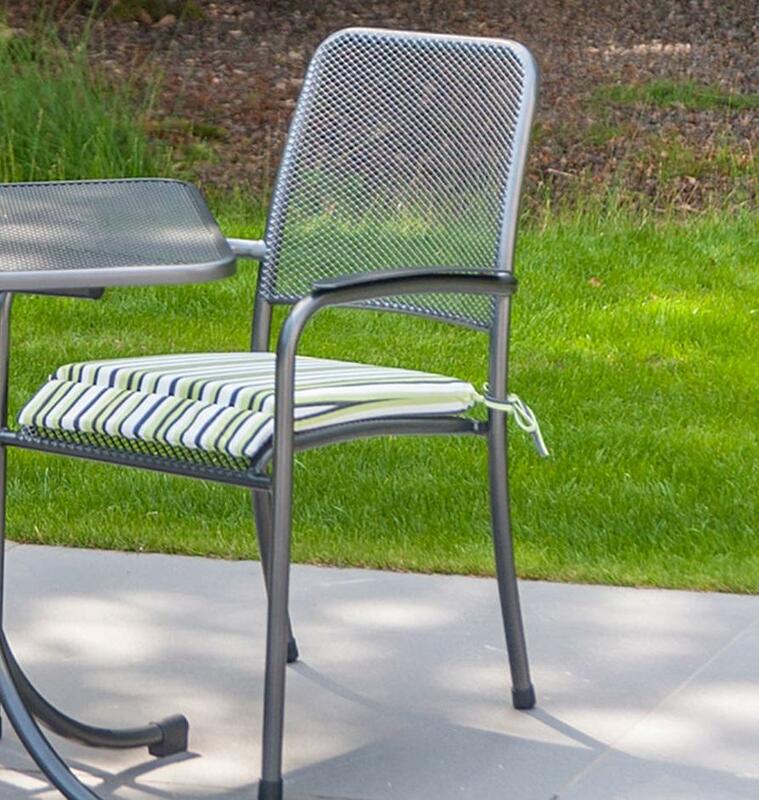 The metal garden furniture is fully weatherproof and designed to be left outside all year round with no need to be covered. 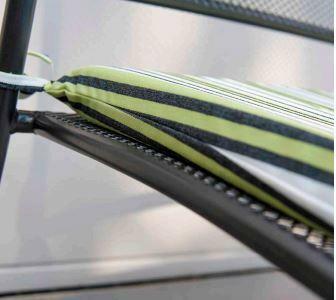 However, the chairs are all stackable making storage easy should you wish to. 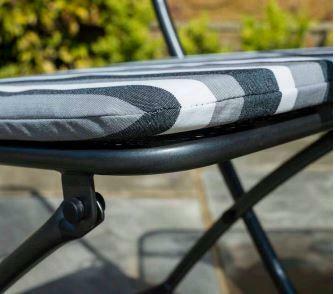 The cushions are made of tough, solution dyed Polyester fabric with a high rating to colour fastness and pre-treated with a waterproof finish on the outside and a PE (polyethylene) layer on the inside making the fabric water resistant. The seams are sewn with an unbreakable outdoor rot-proof marine thread giving a lifelong strength to the seams. We would always recommend storing the cushions, when completely dry, over prolonged periods of wet weather and Winter months to help lengthen their lifespan. But if caught in a summer shower they will dry quickly . All pieces can be purchased separately though so if you wish to have a different combination then please call the Ingarden team on 01732 463409 for more information and a quote.